How do you Get Top Market Value when you Sell? Determining the best asking price for a home is one of the most challenging and important aspects of selling it. It’s a balancing act. On the one hand, you don’t want to set a price so high that it discourages showings and serious offers from qualified, motivated buyers, On the other hand, you don’t want to set a price so low that it attracts lots of interest, but sets the stage for offers and negotiations that will get you less than you’d been more aggressive. This balance is depicted in the Pricing Pyramid below. In a perfect world, your home’s value would be everything you need to fulfill your plans and financial goals. Ultimately though, your home’s value is not determined by you, but by what the market – founded upon supply and demand – is willing to pay for it at a given time. These days, the “market” increasingly refers to buyers who have researched property values online for at least a year, have perhaps viewed multiple homes for sale, and aren’t under any pressure to buy. Try to be impartial. Unfortunately, the “market” isn’t interested in what you originally paid for your home, or how much you need to sell it for to buy your next home. As well, your home may have features that you value, but which actually reduce its market value by limiting the number of potential buyers who’d be interested in buying it. Remember why you are selling. Do you want to sell or do you need to sell? Is a faster sale important to you? Consider the market itself. Are area home prices trending up, down or leveling off? Is there still a lot of listing inventory with high days-on-market numbers? 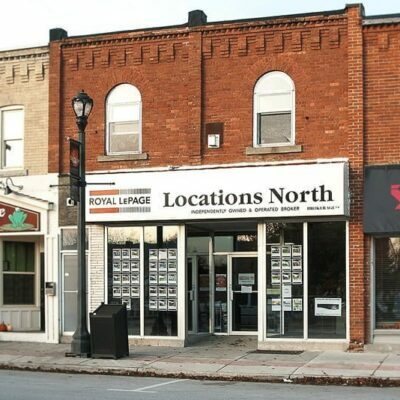 Doing your own online research here at LocationsNorth.com will help keep you informed. While these considerations will yield an approximate market value, the best way to determine your home’s value will be get a Comparative Market Analysis from an experienced REALTOR® who lives the market day-in, day-out. 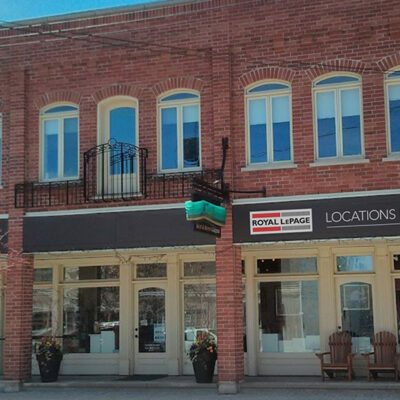 We have 80+ real estate agents in our five offices who’ll be happy to provide you with a CMA. As noted in Strategically Pricing Your Property – 1, the key to getting top market value for your home is to avoid overpricing it such that you get few showings or serious offers; and at the same time, avoid underpricing it such that you get lots of showings and undermarket offers. Real estate sales analysis has repeatedly shown that you’re likely to get top market value if you sell when your home has its greatest market exposure, buyer interest and showing activity. 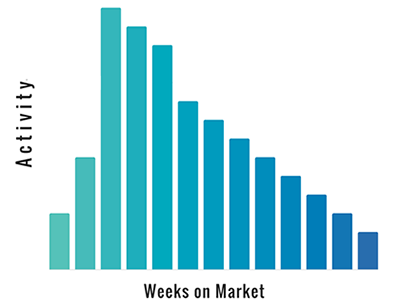 With the exception of hot sellers’ markets, this generally occurs about 2-5 weeks after you list your property, as depicted in the Activity-To-Time-On-Market diagram below. So timing is crucial to getting top dollar. 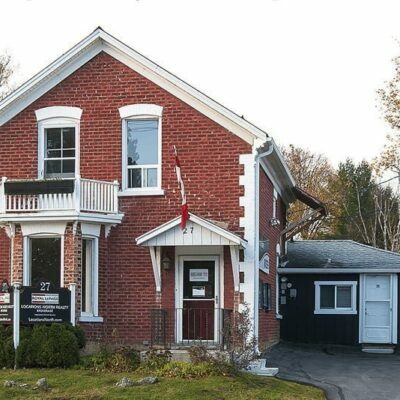 Ideally, you need to price it so you get a firm offer during weeks 2-5 of the listing. This, in turn, means that you need to price you home realistically right from the beginning. The strategy of overpricing your home when you list – knowing that you can reduce the price later – might seem to make sense at first glance. However, it seldom works. In fact, sellers who overprice their homes and then reduce the price one or more times often get less than they would’ve if they’d priced it realistically from the start. 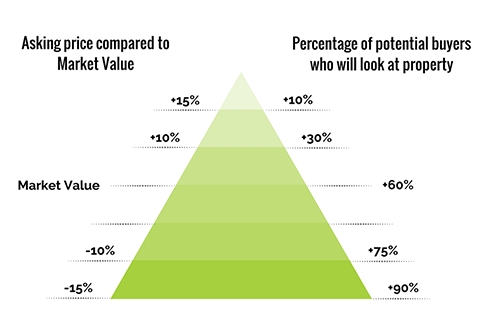 As depicted in the following Sale-Price-To-Time-On-Market diagram, this may mean that you actually get less than market value. Fewer buyers – even if they like your home – will view it if they think it’s overpriced. Fewer REALTORS® will show your home to their buyers if they know your home is overpriced. The right buyers – i.e. those looking to buy a home like yours – may never view it because they’ll confine their search to a lesser price range where yours should be. You’ll attract the wrong buyers – i.e. those looking in your price range – who won’t be interested in your home, having viewed others truly worth what you’re asking. Your overpriced property will make others look better, so you’ll actually help to sell your competition. You’ll get fewer – if any – serious offers because buyers may consider it a waste of time. Even if you do get a serious offer, the excessive price can lead to a mortgage rejection for the buyer if the lender has a professional appraisal done on your home. This leads to critical lost time waiting for finance approvals that never go through. Beyond five weeks, your home will increasingly be viewed as a “stale” listing – i.e. one with a history of being rejected by other buyers. There will be less market buzz among buyers and REALTORS®, less showings, less offers and less likelihood that you’ll get your asking price. When you do eventually reduce the listing price it won’t generate nearly as much interest as if you’d priced it properly from the start. As often happens, after repeated price reductions you’ll end up getting less than if you’d priced it properly from the start. You’ll have to go through the inconvenience and stress of having your home listed for longer and not selling it. Due to not selling your home, you may miss great opportunities to purchase that next home you really want. These may be hard and unpleasant facts for some potential home sellers. However, these are the facts, and they play themselves out all the time in every real estate market. 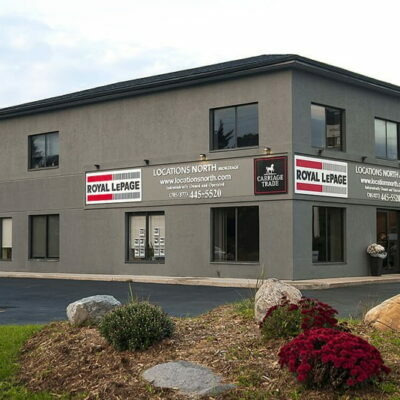 At Locations North we’re committed to getting you top market value for your home when you sell. Our agents know the market inside and out, and the fact that we’re the region’s #1 brokerage is due to their getting so much repeat and referral business from very satisfied clients.